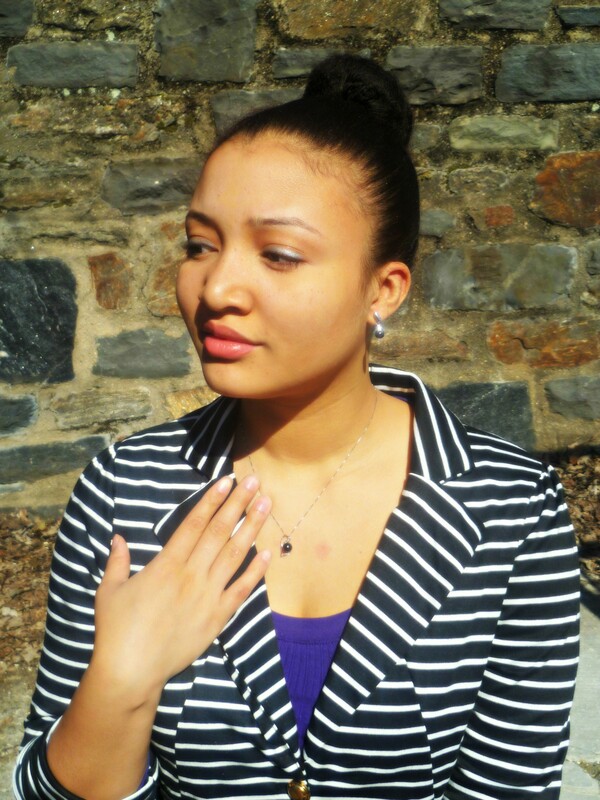 FASHIONISTA IN PEARLS: Ms. Elitou, Fashion Blog Editor of Pearls Only! Our fashion blog editor, Ms. Elitou enjoyed a wonderful sunny day in Philadelphia wearing black pearls from our Black Label Collection. The Edith Earrings made of sterling silver and freshwater pearls are very delicate and feminine and look great with almost anything. She also wore the heart shaped Carlin Pendant that is also a part of the Black Label Collection.The Carlin Pendant is made of 14kt white gold, Japanese Akoya Pearl, and accented with a few diamonds. Ms. Elitou chose to wear it with a black and white striped blazer, and for accent she added a purple shirt. We aim to please when it comes to purchasing pearls from Pearls Only. When we deliver every package, we include a gift box, an appraisal certification, a beautiful storage bag, a 90-day money back guarantee and a few sample pearls. Have you purchased pearls from Pearls Only? We would love to know your experience. Send us a photo with your name, your website (if applicable), and share with us your experience with Pearls Only and we may feature your story on our blog. Send everything to [email protected] with the subject line: PEARL EXPERIENCE. We look forward to reading! This entry was posted in PearlsOnly Blog and tagged black label collection, fashion, jewelry, lookbook, ms. elitou, Pearls, pearls only, style, young hip chic by PearlsOnly Team. Bookmark the permalink.